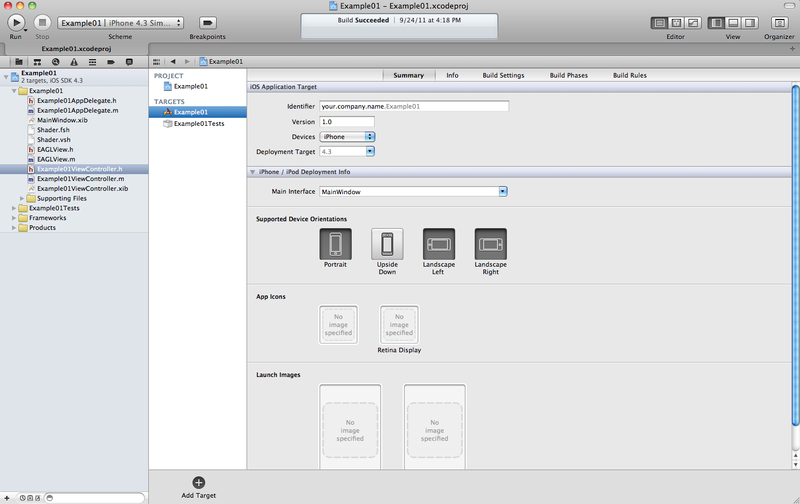 Home About Programming Archive for category "iOS, Cocoa Touch"
The next class we are going to analyze is EAGLView. The prefix EAGL means Embedded Apple OpenGL. EAGLView class is the kernel of this application. 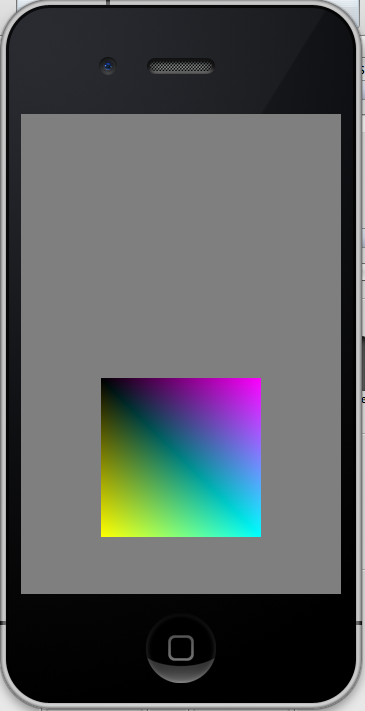 Its responsability is to provide the OpenGL ES context which shall allow us to render on device’s screen. //  Created by mmalc Crawford on 11/18/10. //  Copyright 2010 Apple Inc. All rights reserved. // This class wraps the CAEAGLLayer from CoreAnimation into a convenient UIView subclass. // The view content is basically an EAGL surface you render your OpenGL scene into. // Note that setting the view non-opaque will only work if the EAGL surface has an alpha channel. // The pixel dimensions of the CAEAGLLayer. // The OpenGL ES names for the framebuffer and renderbuffer used to render to this view. @class EAGLContext; is a forward declaration of the class EAGLContent that should be imported later on someone in the project. 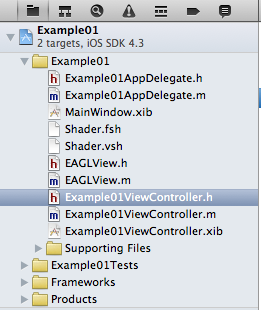 The class EAGLView inherits the class UIView. The UIView class belongs to the UIKit is a framework which provides all classes we needed to construct and manage the application’s user interface. Also, it provides an application object, drawing model, windows, views, and controls for the touch screen interface. //The EAGL view is stored in the nib file. When it's unarchived it's sent -initWithCoder:. // Create default framebuffer object. // Create color render buffer and allocate backing store. // The framebuffer will be re-created at the beginning of the next setFramebuffer method call. As you may notice we are importing QuazCore. The QuazCore is a framework which provide us with access to Core Animation and other effects. The Core Animation provide us a layer which allow OpenGL commands to render with optimal performance. 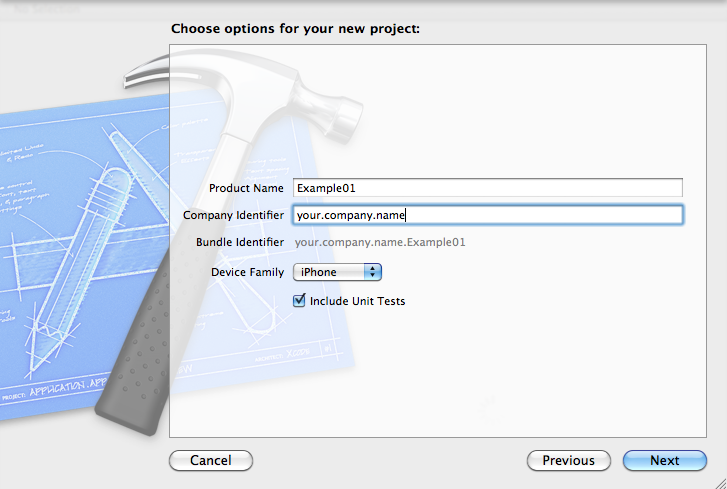 In Objective-C there is not thing such as private method. However, that doesn’t mean that you cannot specify that something should be considerate private. Some people considerate this a hack created especially for Objective-C. Objective-C is purely dynamic. This means that the moment of method dispatch the exact same dynamic method resolution point as every other method dispatch. What does this means? This means that at runtime, every method implementation has the same exposure. Every method implementation of the APIs provided at runtime will work with methods and selectors equally the same across all methods. However, indicating that something is private and shouldn’t be used outside is a way to enforce some discipline from the programmer. As you may see, createFrameBuffer and deleteFrameBuffer must be considerate private and being used as such. Next, we declare the method layerClass. 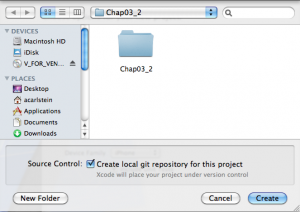 This method shall override the layerClass method inherit from the UIView class. This method must return the class CAEAGLLayer because this class is a wrapper for a Core Animation surface. 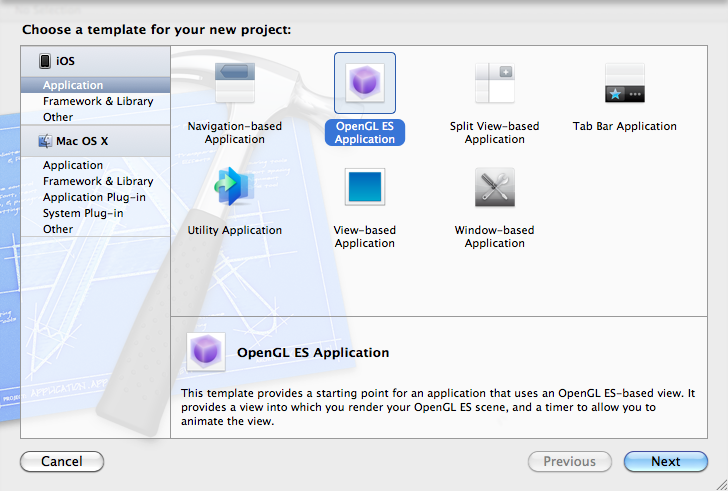 CAEAGL means Core Animation Embedded Apple OpenGL. The CAEAGLLayer class provide us with support for drawing OpenGL content. The initWithCoder method will be the first method to be called. In this method, the parent’s initWithCoder method is called first. if the object returned match then we assign it to the self property. Later, we point with eagleLayer pointer to the object’s CAEAGLLayer. The property opaque of the object’s pointed by eaglLayer is set to TRUE. This means that we are not going to allow the rendering to be transparent. This will provide us with a good performance since allowing CAEAGLLayer object to be transparent would require a lot of blending to the content behind the layer. Next, we are setting drawableProperties. This property allow us to provide a dictionary of objects and keys. They specify when the drawable surface will retain its contents after displaying them. Plus it will set the internal color buffer format which will be used for the drawable surface. This may seems complicated but it is not. Lets brake it down so we can understand. NSDictionary is a class which declares the programmatic interface to objects. These objects will be a manager of immutable associations of keys and values. dictionaryWithObjectsAndKeys is a class method which belongs to NSDictionary class. dictionaryWithObjectAndKeys method shall creates a dictionary which containing entries constructed from the specified set of values and keys and then return it. In order to return us this dictionary, we need to provide some arguments to dictionaryWithObjectsAndKeys. The first value is [NSNumber numberWithBool:FALSE], numberwithBool is a class method from NSNumber class. Since the its argument is set to FALSE, numberWithBool will create an NSNumber object containing a given value (FALSE) and treating this value as a BOOL.Then it will return us this NSNumber Object which will be used as the first parameter of dictionaryWithObjectsAndKeys. This first parameter is actually the first value that we will add to this new dictionary. kEAGLDrawablePropertyRetainedBacking, kEAGLColorFormatRGBA8, kEAGLDrawablePropertyColorFormat, are other values that are going to be added. kEAGLDrawablePropertyRetainedBacking is the first key and it is set to ‘false’. This key, kEAGLDrawablePropertyRetainedBacking, determine whether the surface retains whatever is drawn on it which means the layer won’t autorefresh its contents. kEAGLColorFormatRGBA8 indicates that we are setting the template to a 16 bit RGB with Alpha. kEAGLDrawablePropertyColorFormat sets the internal color buffer for the layer. nil is used to indicate that we null-terminated the list of alternating values and keys. Finally, initWithCoder method return the object self. These examples are provided for educational purposes. Using this code is under your own responsibility and risk. The code and information is given ‘as is’. I do not take responsibilities of how they are used. 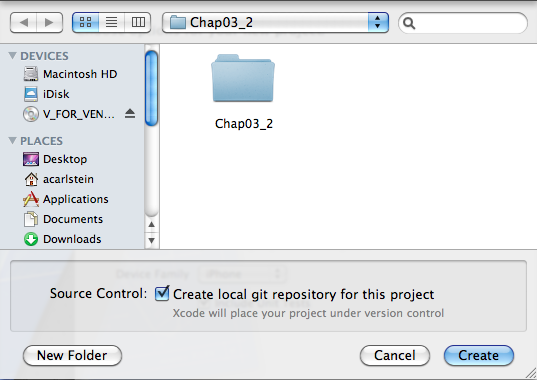 In this part, we are going to analyse the files that were generated by XCode when we created our project. I am assuming that you have some knowledge in C/C++ and also about terms normally used in programming languages. Either way, I will try to provide you with links and/or explanations of terms that I will be using. 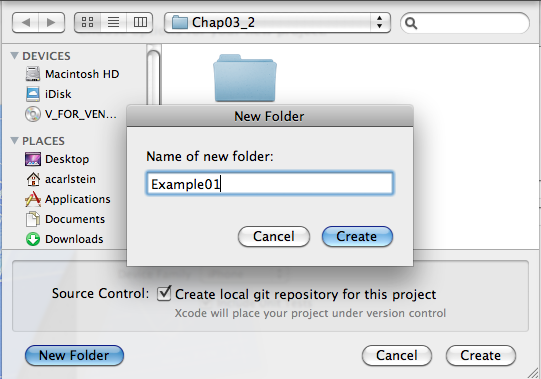 In Objective-C there are two kind of files. 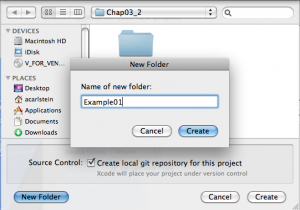 Files with the extension .h are called header files. Files with the extension .m are implementation files. //  Created by Alejandro G. Carlstein Ramos Mejia on 9/24/11. //  Copyright 2011 Alejandro G. Carlstein Ramos Mejia. All rights reserved. #import <UIKit/UIKit.h> is the header of the library UIKit framework. The UIKit framework are a set of classes, objects, event handling, windows, views and controls that allow you to create and administrate your application’s user interface. @class Example01ViewController; is a forwarding declaration. A forwarding declaration tells the compiler that we will be using this class and we shall import it somewhere later. This reduce the changes of doing circular references. @interface keyword indicate that we will be declaring the interface of our class. In this case, the name of our class is Example01AppDelegate. 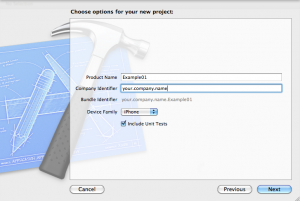 This class will inherit the class NSObject and will be using the protocol UIApplicationDelegate. A class is a blueprint for creating one or more objects. UIWindow *window; creates a pointer of type UIWindow. The UIWindow class provide methods that allow us to administrate the windows our application will displays on the screen and distribute the events to the views. Example01ViewController *viewController; creates a pointer (similar to pointer in C/C++) of type Example01ViewController class which is a class listed in our project. A view controller allow us to manage the view and help us with navigation and memory management. We shall analyse this class later. @property keyword allows us to declare a getter and setter accessor methods used for encapsulation, so we don’t have to write them. Inside the parenthesis we put the property attributes. In this case, we use nonatomic which indicates the compiler not to worry about multithreading. Also, we use retain which indicates the compiler to retain that we will take care of managing the passed-in variable before setting the instance variable. IBOutlet is a macro which defined variables and methods that can be referred to the Interface Builder. If your application supports background execution, this method is called instead of applicationWillTerminate: when the user quits. Called as part of the transition from the background to the inactive state; here you can undo many of the changes made on entering the background. Lets begin analyzing this file. The @synthesize keyword tells the compiler to create a getter and setter for (in this case) the variables (also called ivars) window and viewController. First, you may notice the hyphen “-” in front of (BOOL). The hyphen “-” is to indicate that this is for an instance method. If you will see a plus “+” sign instead, this would indicate that this is a class method (similar to static in C++). (BOOL) indicates what is going to be returned from the method. This type can be set to YES or NO (different to the keyword bool used in C++, which can be set in true or false). application is the name of the method. The colon “:” after application is to indicate that the following are going to be the declaration of the parameters of the method. 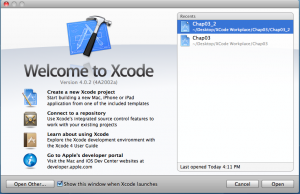 (UIApplication *)application is a parameter of type UIApplication pointer the same as (NSDictionary *)launchOptions is a parameter too; however, you may notice that after application we have didFinishLaunchingWithOptions. didFinishLaunchingWithOptions is a parameter label. Parameter labels are used to differentiate methods with the same name but instead of doing it base on their types (as in C/C++), they are being differentiated by labels instead. They are the replacement of “pointers on member functions”. Pointers on member functions are expressed as Selector in Objective-C.
Again you can see that this method is an instance method due the hyphen “-” used at the beginning. The name of the method is applicationWillResignActive and this method have one parameter application which is a pointer of type UIApplication. 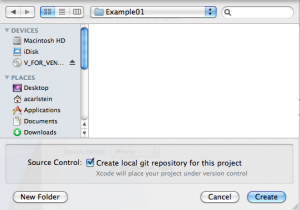 Example01AppDelegate is a class that inherits NSObject and use UIApplicationDelegate protocol. applicationWillResignActive: called before the application is deactivated, for example: The Home button is pressed by the user. applicationWillEnterForeground: called before application gain focus again and stop working in the background. applicationDidBecomeActive: called after the application becomes active. applicationWillTerminate: called before the application terminates. [self.viewController stopAnimation]; is calling the method stopAnimation which belongs to the object viewController that we are pointing at. This is a method that we need to include in every class. As you may notice. we are relasing window and viewController to free memory, and we are calling the dealloc method of the superclass NSObject which we inherit. Almost every class in Objective-C inherits from NSObject, NSObject have the basic interface to the runtime system and allow them to behave as Objective-C objects. It provide allocation and initialization. Just to make sure, in cocoa touch, there is no garbage collection. The dealloc method is normally called when a class is no longer needed and its “retain counter” has reached zero. After finish my last project, Cupid-4-Stupid, for the Android Market, I decided to play around the iPhone/iTouch. Even do most of the code seems to work, many produce warning all around; so, I have to do what I do best… improvise. I am going to post the different steps I am taking in order to learn how to program on iOS and OpenGL using XCode and Objective-C.
Just to clarify, iOS use OpenGL ES which is a lite version of OpenGL. 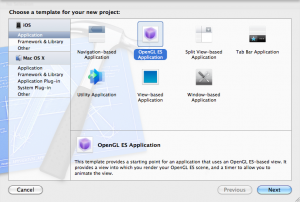 At the momento of writing this post there are two versions of OpenGL ES: OpenGL ES 1.0 (ES1) and OpenGL ES 2.0 (ES2). 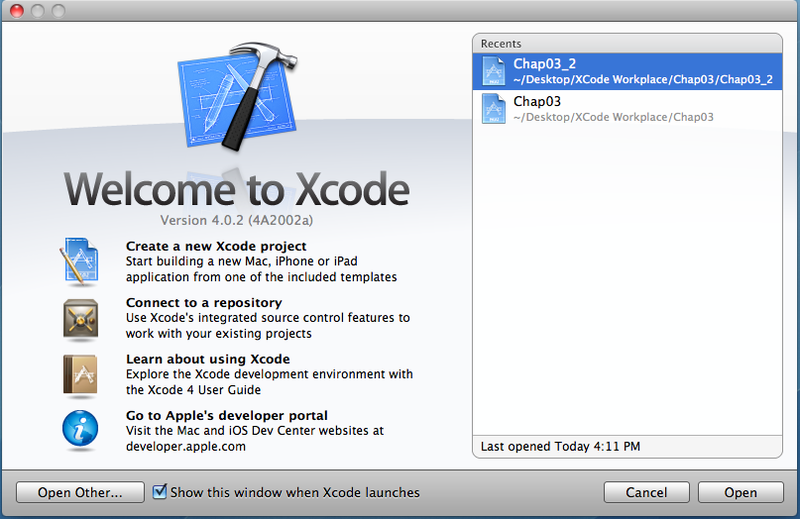 I bought XCode version 4.0.2. It cost me around 5 dollars. Later on, I found out the negative reviews that this version had generated. I am hoping that soon Apple address all the issues that people are complaining around the web. Now you should see what I call the workbench, where you will be working on. The code that makes this work is already done for you. 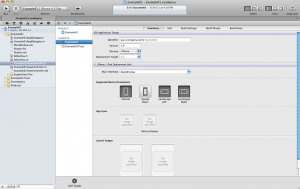 Now you are ready to begin modifying and adding your own files. Check for the next part of this tutorial. 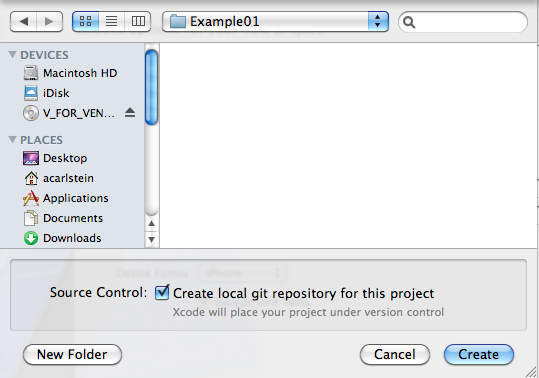 We shall start analyzing the basic files that Xcode generates for your example to work.